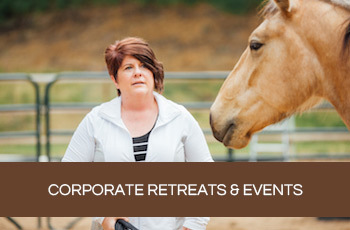 A few days ago, I met a new client, whom I’ll call Jill, for an equus coaching session. We spent the first few minutes getting to know one another and then discussing some possible exercises we could do together. When it was time to begin, a brown and white gelding named Patriot entered the round pen where we were standing. I gave Jill and Patriot a few moments to observe one another and then I asked Jill what she wanted to focus on during our session. Jill’s intention made me smile. Not because she was feeling sad or flat, but because just two days prior, I had been sitting in meditation with a similar thought. In the meditation, I was observing a herd of horses. 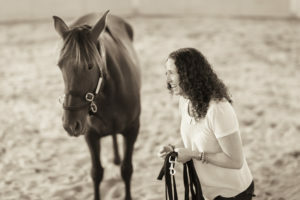 As I settled into the feeling of the herd and the herd environment— which was marked by a deep connection and symmetry—something struck me: I noticed that each horse was being guided by his or her own desire. It was something that I had taken notice of many times before. Yet as I reflected on my human relationships while watching the horses follow their personal desire, it caught my attention in a new way. Not one was concerned or preoccupied with the others. If one horse was sleepy, she stopped to take a snooze. If another wanted to play, he started to trot, exploring places in the paddock that seemed intriguing or nudging another horse to come along. If another was feeling hungry, she foraged. Each horse moved in accordance with her own personal desire, and yet the herd as a whole functioned in beautiful, cohesive harmony. This was a revelation! I don’t know about you, but growing up, this was not how I was taught to connect with others. I was taught—as was my mother, as was my grandmother, as was my grandmother’s mother—that the loving thing to do in any given moment, was to notice what other people might need or want and try my best to offer it to them. My love was measured by how willing I was to ignore my own desires and try to serve others. Paradoxically, instead of bringing me closer, this dynamic only seemed to create distance and imbalance in my relationships. I took this synchronicity between Jill’s intention and my meditation as a wink from the universe. It was a gentle message to pay closer attention to the wisdom of animals and how they use their desire to guide them into harmony with themselves and others. It was time to peel away another layer of the human cultural story I had been carrying around—that said the desires of others should take precedence over my own and that to explore my own desires is selfish—beliefs that were not serving me or Jill. With this on my mind, I invited Jill to engage with Patriot and see what he might offer her. 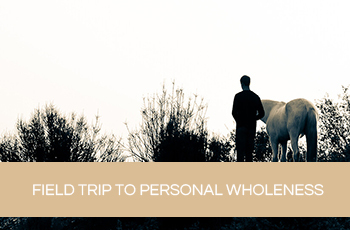 Horses have an uncanny way of mirroring our energy and the dynamics we create in our lives. Jill proceeded to walk around the round pen. Her demeanor seemed unsure and hesitant. Her shoulders hung low. She kept looking over to see what Patriot was doing and if there was anything she could do to make him feel more comfortable. She tried inviting him to walk with her, she tried brushing flies away from his face, she tried giving his belly a scratch. All the while, Patriot seemed disinterested. No sooner did Jill turn her awareness back to Patriot, than he walked away from her, circled the ground and dropped to his knees. Groaning with bliss, Patriot rolled in the sand first on his left side, then over to his right. After several iterations of rolling and sighing, Patriot stood and shook the sand free from his coat. He seemed utterly delighted. Jill wasn’t sure what what this would look like, but she was up for the challenge. I asked her to find a state of play and experiment with what felt good. She tried many different things. She noticed a desire to create a playful movement, so she began skipping through the pen. As soon as she did this, Patriot’s attention turned back to her and he began to mirror her movements. Then, she paused to stand still. Patriot came over and she instinctively started to pet him, but noticed that it wasn’t really what she wanted to be doing. Patriot noticed too and walked away. Jill shifted gears and went back to galloping around the pen. Patriot took notice and followed her. She went in one direction and then another, and each time Patriot would change direction too. Jill was thrilled. In this way, they started to play together and really engage. In tracking her own pleasure, Jill found a way to communicate what was authentic and fun for her and also engaging. Time and time again, the more Jill got in touch with her own joy, the more Patriot wanted to connect and play with her. Liberated from the sense of responsibility for Patriot and trying to control his experience of her, Jill was free to start having an experience of herself. Honoring our own desires is a bold act of trust. Life has an intelligence that plays itself out through us and guides us from moment to moment. When we override that intelligence with imposed ideas about what we are supposed to want or how we are supposed to act, we stop the natural harmony that is creating its way through us, and never find out where it might lead. My experience with Jill inspired me to take on a challenge that I’d like to invite you to join in as well. This month, I’m going to pay more attention to tracking my desires. I’m going to notice what brings me pleasure and joy, and lean into those feelings. I am going to boldly trust that by acting in integrity with my own desire, the universe will lead me into a greater state of harmony and connection with myself and the people in my life. The past generations of women in my family may find it selfish, but I believe that actually the most loving thing we can do in any given moment is follow our own joy and see where it takes us. ”I can't find any other way to describe Koelle, but to say that she is other worldly. Wise beyond her years in this lifetime, loving like we've been best friends forever, gentle in the most elegant way as she quietly guided me to truly see myself. My experience led to a profound depth of understanding and shift. All of this in two short, magical days with a horse as our co-pilot. I am forever changed and I want more!"